When you are looking to buy silver in San Diego it can be hard to know where to go. It is everyone’s fear that they will get ripped off and end up out of pocket. Fortunately, there are a number of reputable shops in San Diego. First here are a few things you should know… Buying silver in San Diego attracts a sales tax of 8.75% on purchases under $1500. If you buy more than this amount then there is no sales tax in San Diego coin shops. State sales tax laws vary markedly. If you are looking to buy from a state that is “tax-free” it is possible to buy online and not pay sales tax. You may have to pay a “use tax” for these purchases though. Ensure that you understand your responsibilities when buying silver in San Diego. Here are three shops you might want to check out in the San Diego area. The Old Coin shop may not look the most reputable and impressive establishment on the face of the planet but it certainly has a sterling history. With over 45 years of sourcing and selling the best coins in the San Diego area, and from further afield, it is well worth a visit. Founded in 1960 by Harlan White the shop is a regular Aladdin’s cave and a truly exciting visit for any coin enthusiast. The shop stocks over 6000 coins and has helped literally thousands of collectors enhance their collection. The Old Coin Shop has seen some wonders. They even at one point had the $1 million dollar valued Dexter specimen (one of 15 ever made). This company comprises two shops that deal in a wide spectrum of coins for every numismatist. Coins are available from the US, Overseas and even ancient times. Alongside this the shops stock bullion bars and modern silver coins. The Bullion and Coin shop is conveniently positioned in the center of San Diego on Clairemont Mesa Blvd. It is open Monday to Friday, 9-5 and Saturday 10-4. The Coin shop is on Girard Avenue and is open Tuesday to Friday 9.30 to 4.30 and Saturday 11.30-3. 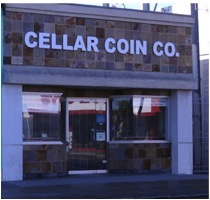 The Cellar Coin Company has been a major player in the San Diego Coin community for over 40 years. They focus on their client relationships and have many clients who come back again and again. They sell for both precious metal investors and numismatists. In stock are mint sets, proofs, commemorative coins and currency. On top of this they both buy and sell silver and other bullion.